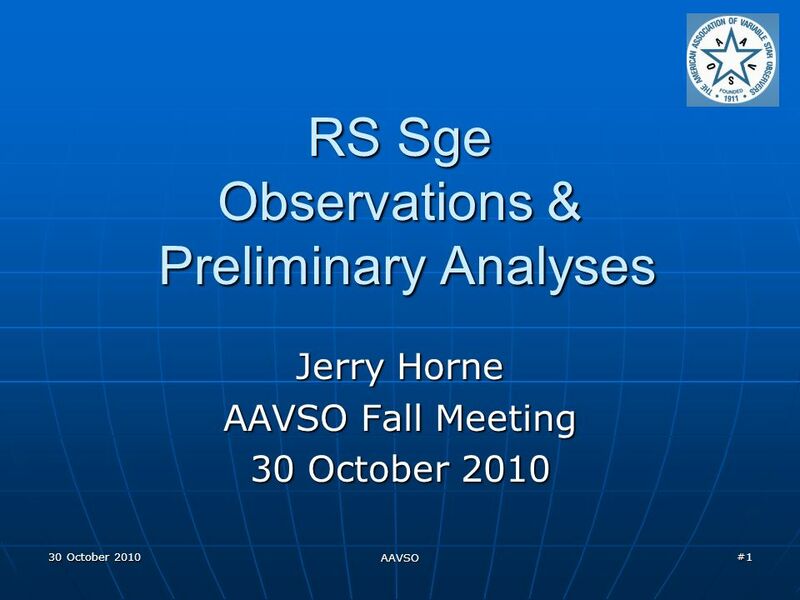 30 October 2010 AAVSO #1 RS Sge Observations & Preliminary Analyses Jerry Horne AAVSO Fall Meeting 30 October 2010. 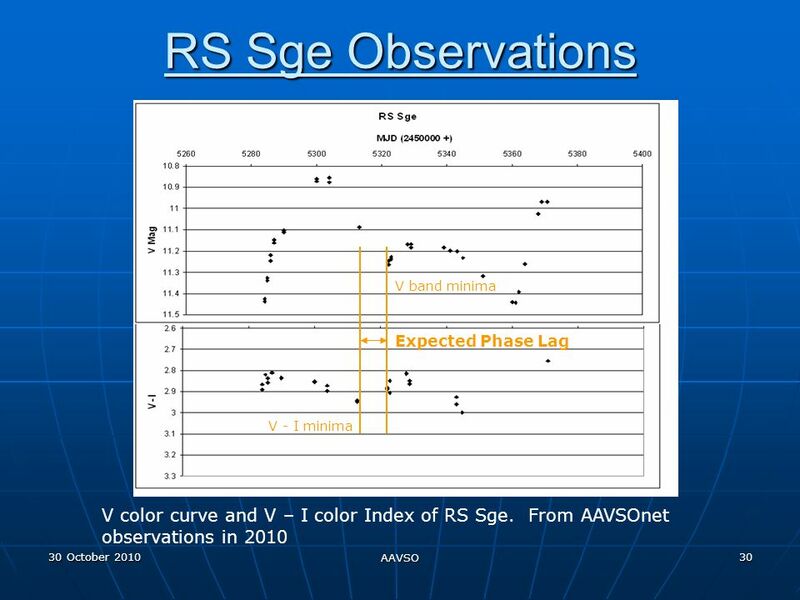 3 30 October 2010 AAVSO 3 Abstract New V, B, Ic, and R band photometry or RS Sge is obtained. 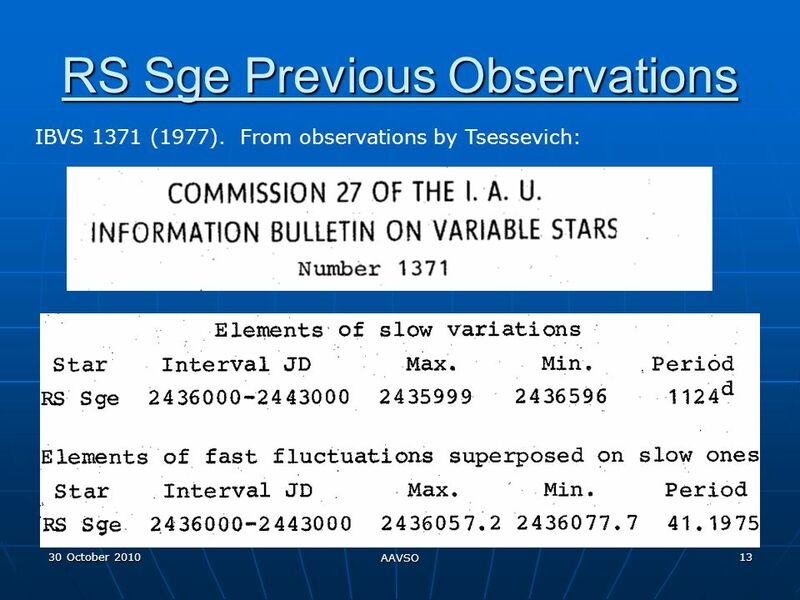 These new observations, when combined with other published observational data, allowed the determination of multiple period values for each star. 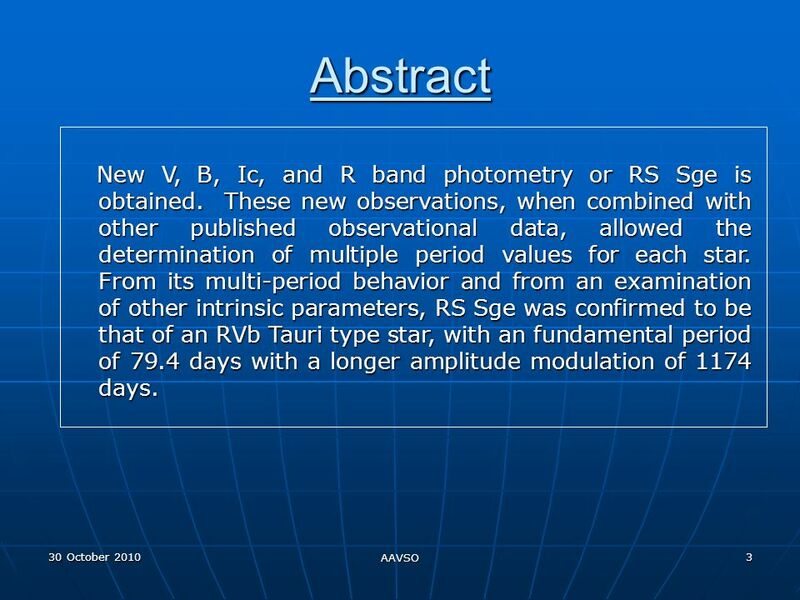 From its multi-period behavior and from an examination of other intrinsic parameters, RS Sge was confirmed to be that of an RVb Tauri type star, with an fundamental period of 79.4 days with a longer amplitude modulation of 1174 days. 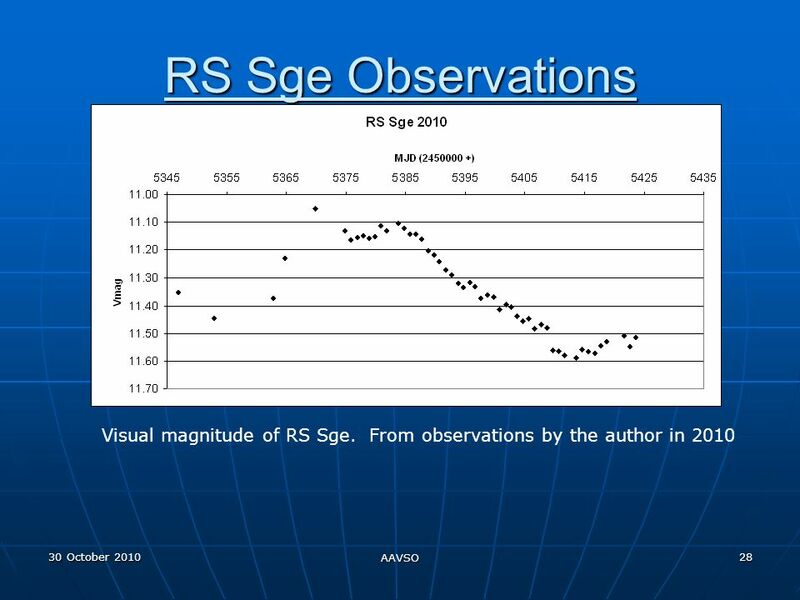 New V, B, Ic, and R band photometry or RS Sge is obtained. 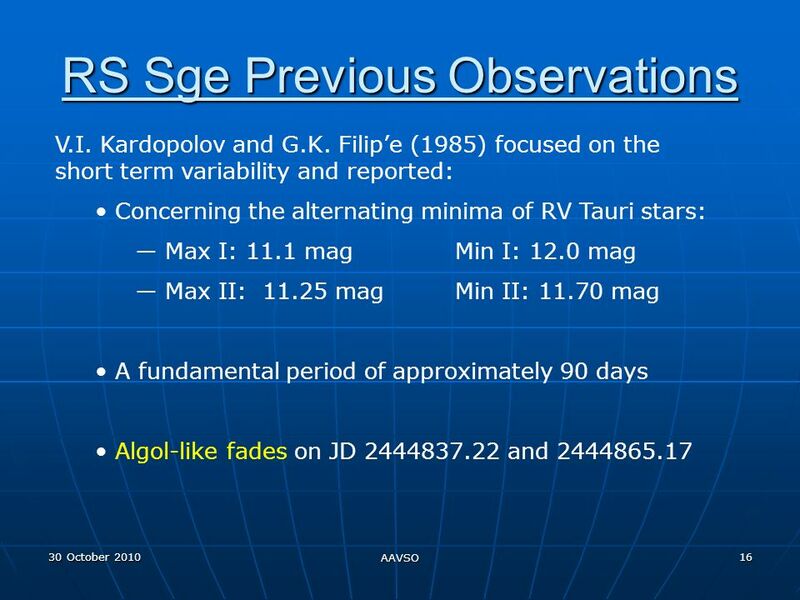 These new observations, when combined with other published observational data, allowed the determination of multiple period values for each star. 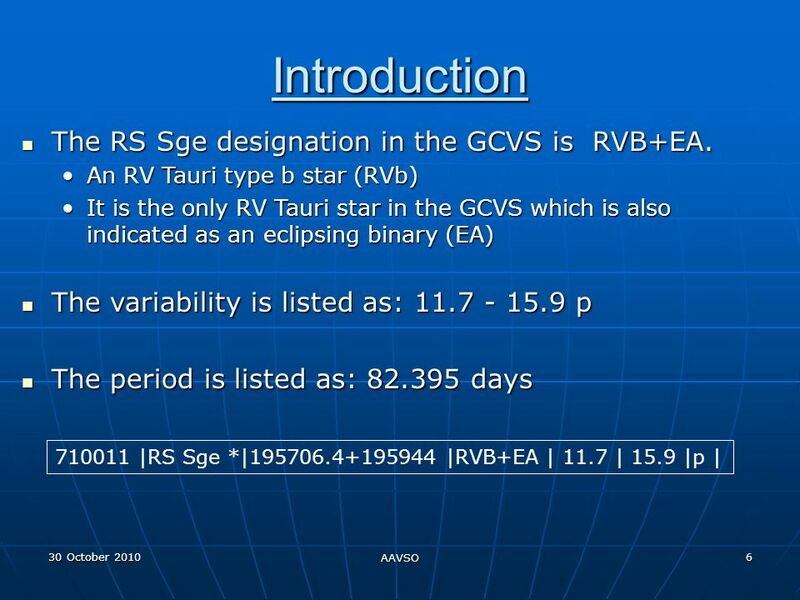 From its multi-period behavior and from an examination of other intrinsic parameters, RS Sge was confirmed to be that of an RVb Tauri type star, with an fundamental period of 79.4 days with a longer amplitude modulation of 1174 days. 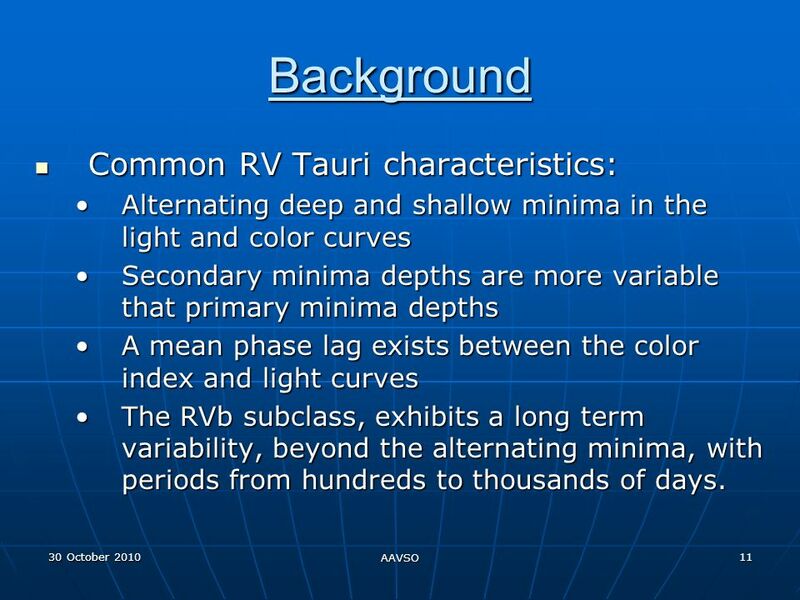 11 30 October 2010 AAVSO 11 Background Common RV Tauri characteristics: Common RV Tauri characteristics: Alternating deep and shallow minima in the light and color curvesAlternating deep and shallow minima in the light and color curves Secondary minima depths are more variable that primary minima depthsSecondary minima depths are more variable that primary minima depths A mean phase lag exists between the color index and light curvesA mean phase lag exists between the color index and light curves The RVb subclass, exhibits a long term variability, beyond the alternating minima, with periods from hundreds to thousands of days.The RVb subclass, exhibits a long term variability, beyond the alternating minima, with periods from hundreds to thousands of days. 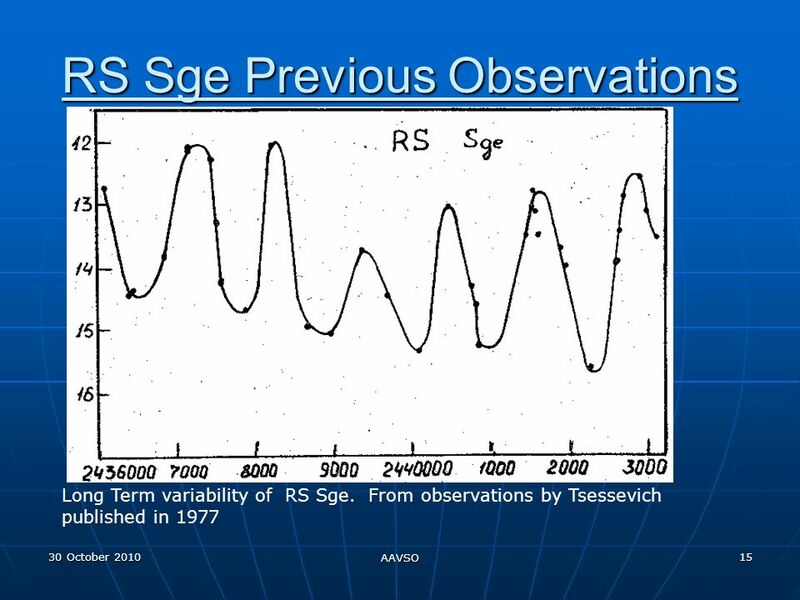 18 30 October 2010 AAVSO 18 RS Sge Previous Observations Long Term variability of RS Sge. 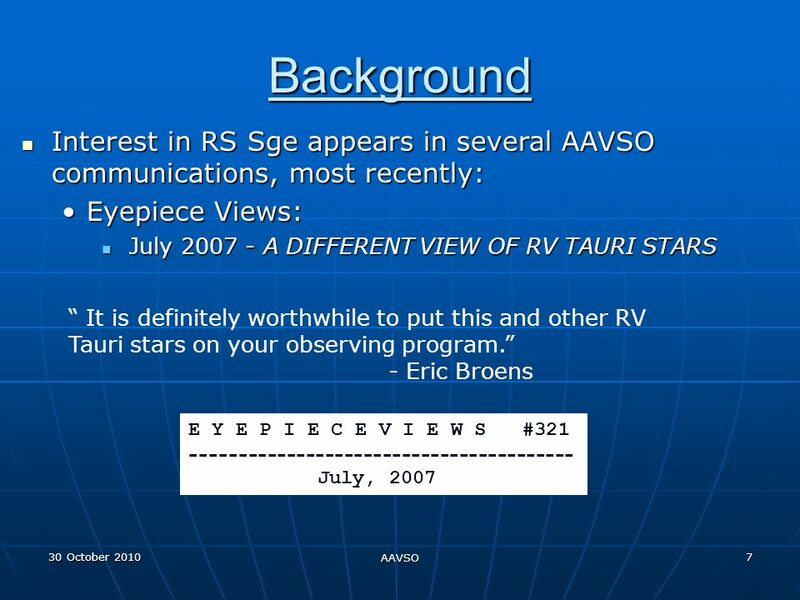 From observations submitted to the AAVSO (Trend line added). 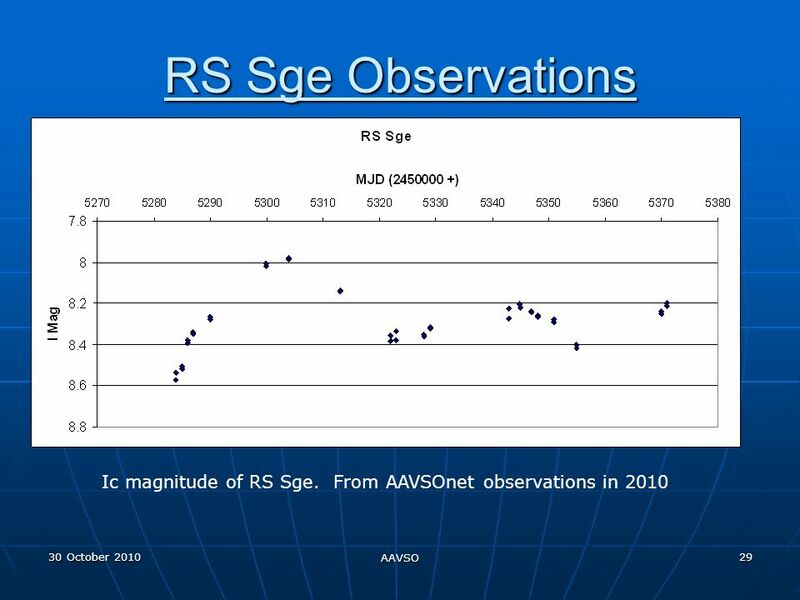 20 30 October 2010 AAVSO 20 RS Sge Previous Observations Visual magnitude of RS Sge. 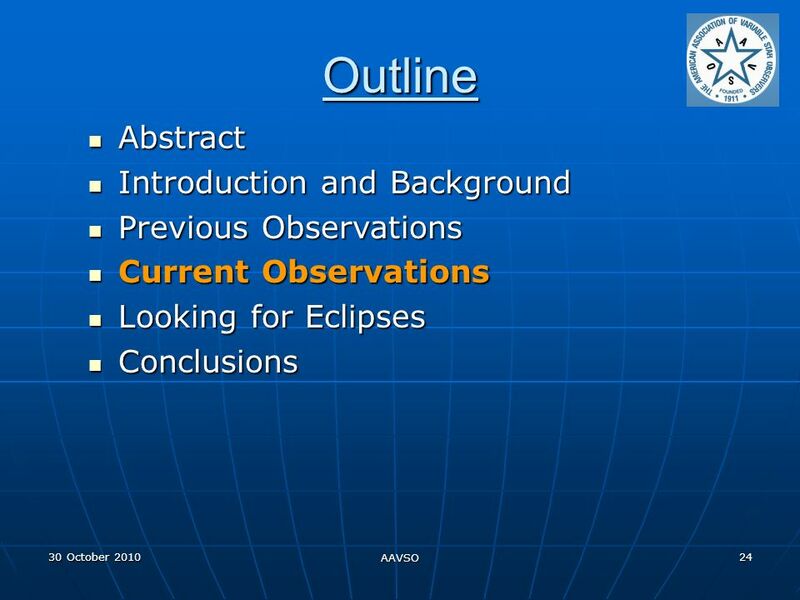 From ASAS observations from 2003-2008 Eclipses? 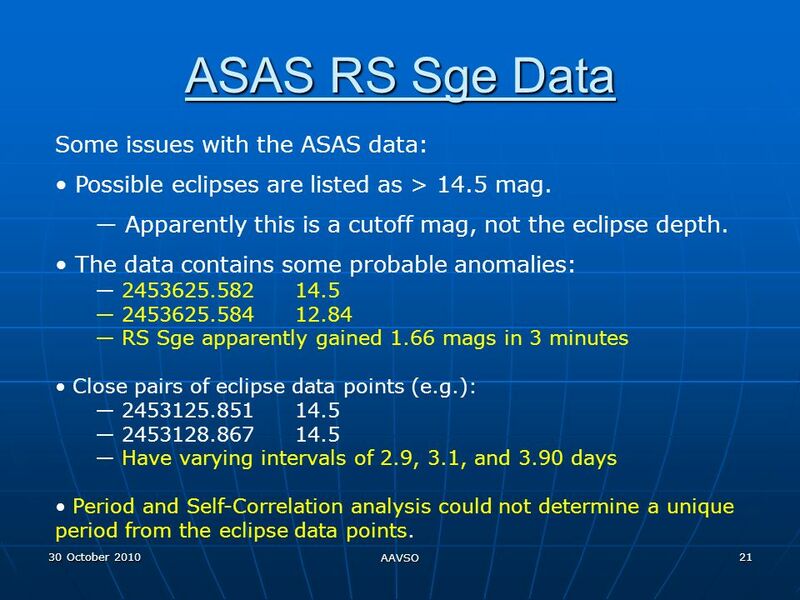 21 30 October 2010 AAVSO 21 ASAS RS Sge Data Some issues with the ASAS data: Possible eclipses are listed as > 14.5 mag. 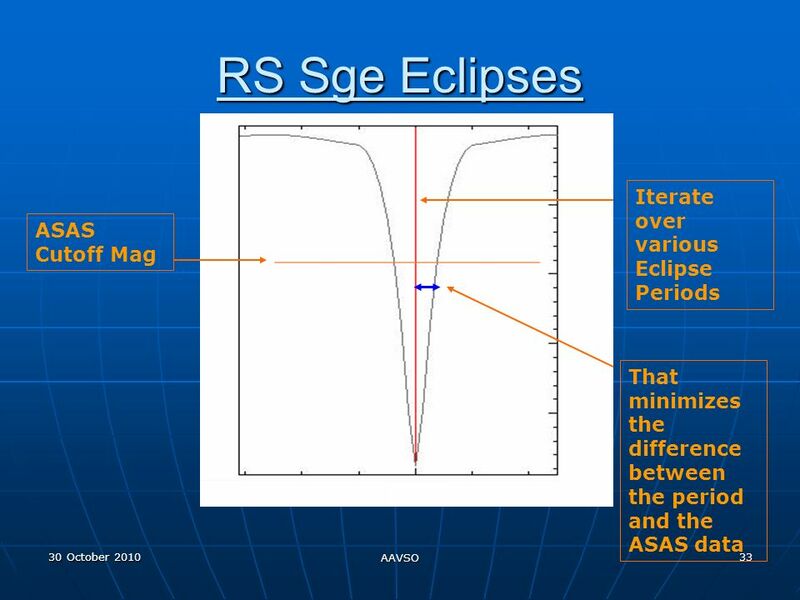 Apparently this is a cutoff mag, not the eclipse depth. 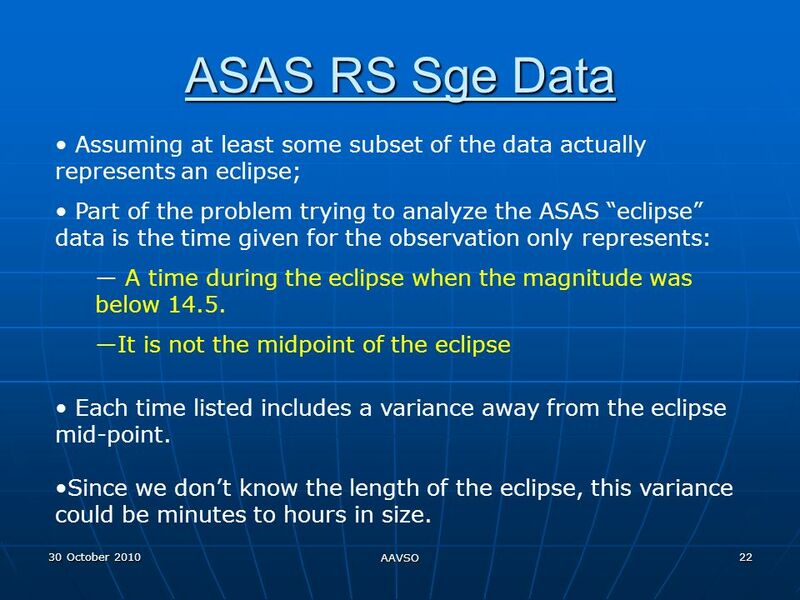 The data contains some probable anomalies: 2453625.58214.5 2453625.58412.84 RS Sge apparently gained 1.66 mags in 3 minutes Close pairs of eclipse data points (e.g. 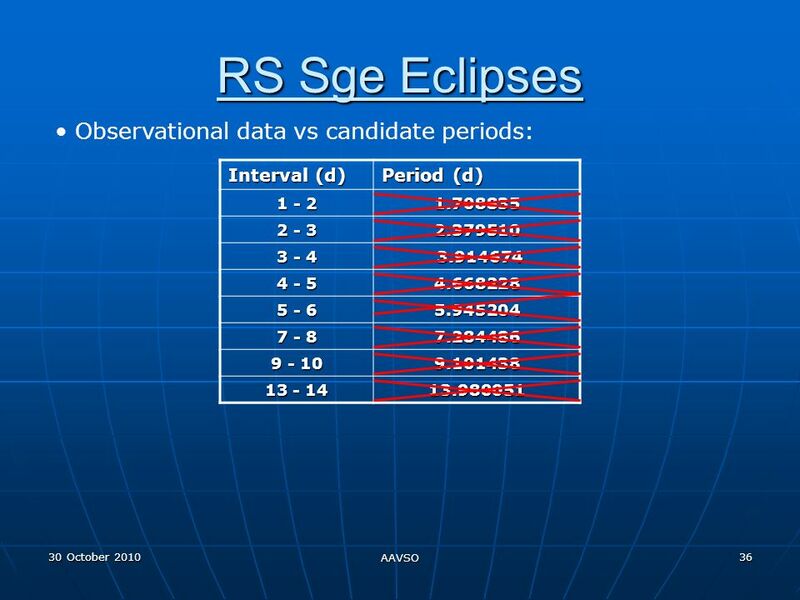 ): 2453125.85114.5 2453128.86714.5 Have varying intervals of 2.9, 3.1, and 3.90 days Period and Self-Correlation analysis could not determine a unique period from the eclipse data points. 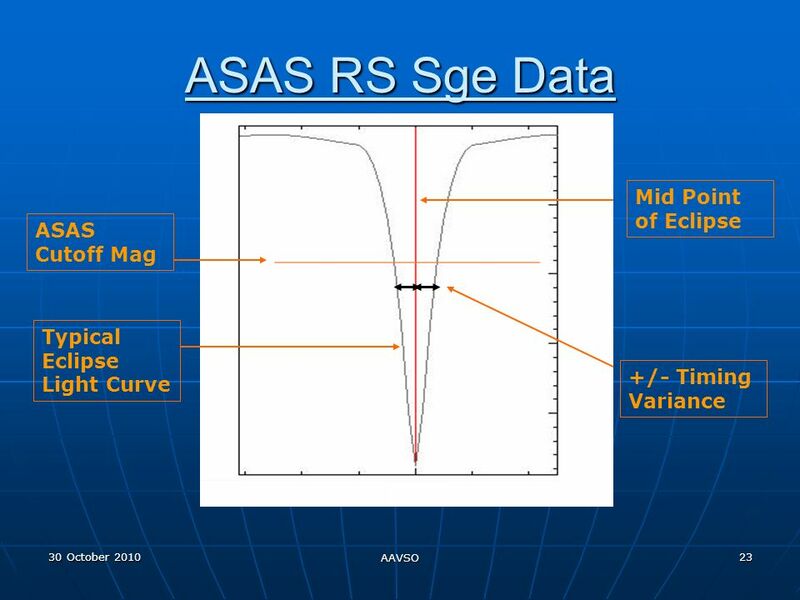 22 30 October 2010 AAVSO 22 ASAS RS Sge Data Assuming at least some subset of the data actually represents an eclipse; Part of the problem trying to analyze the ASAS eclipse data is the time given for the observation only represents: A time during the eclipse when the magnitude was below 14.5. 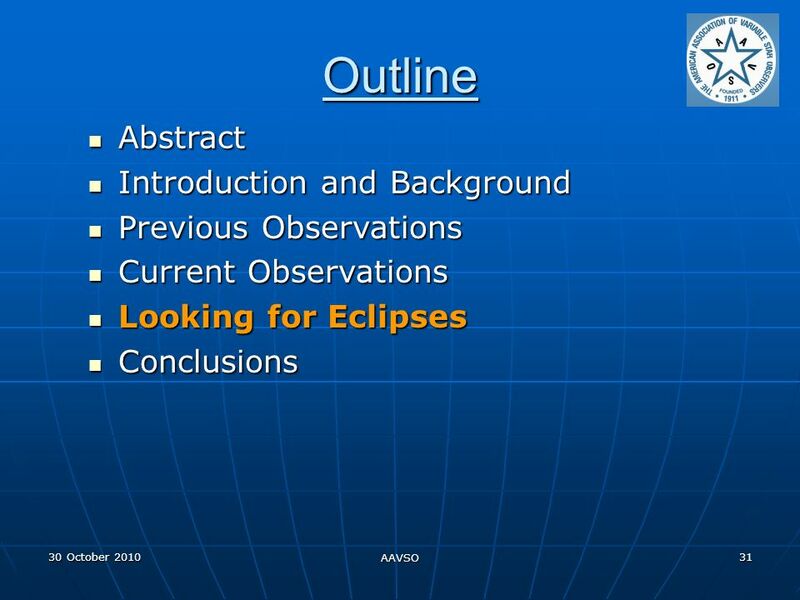 It is not the midpoint of the eclipse Each time listed includes a variance away from the eclipse mid-point. 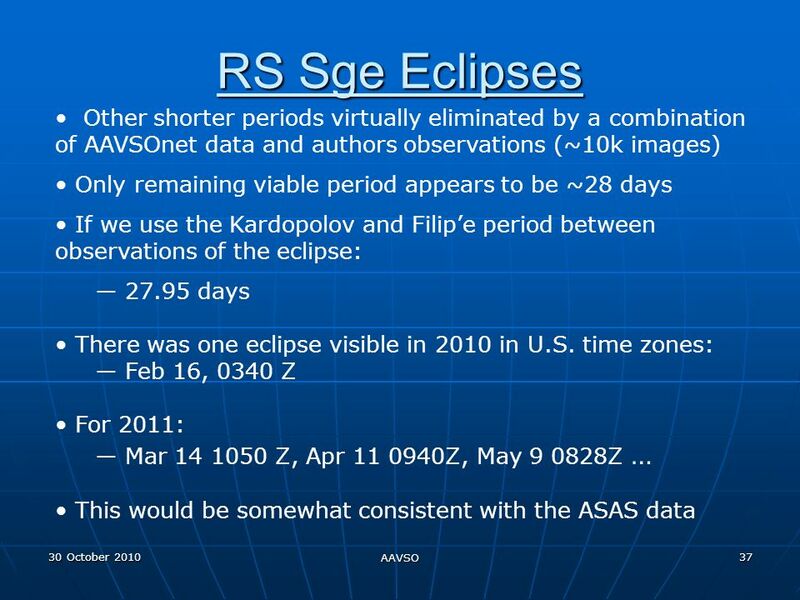 Since we dont know the length of the eclipse, this variance could be minutes to hours in size. 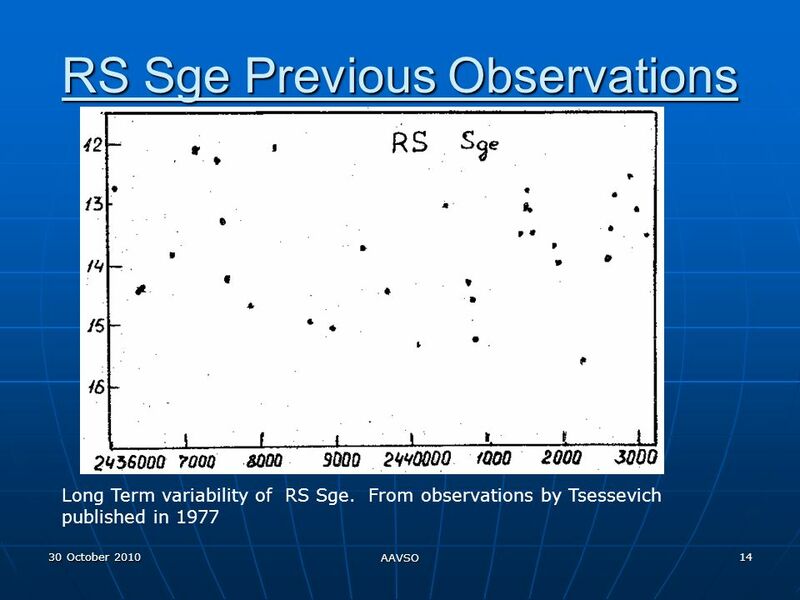 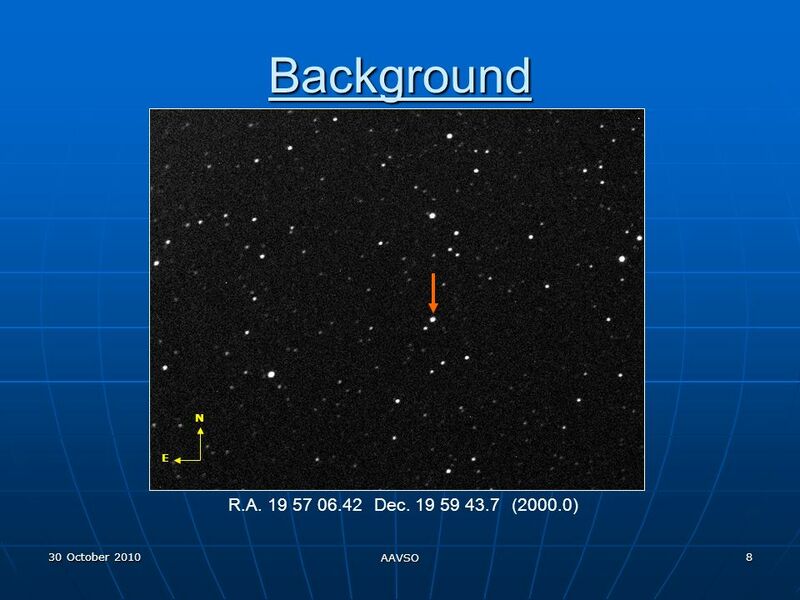 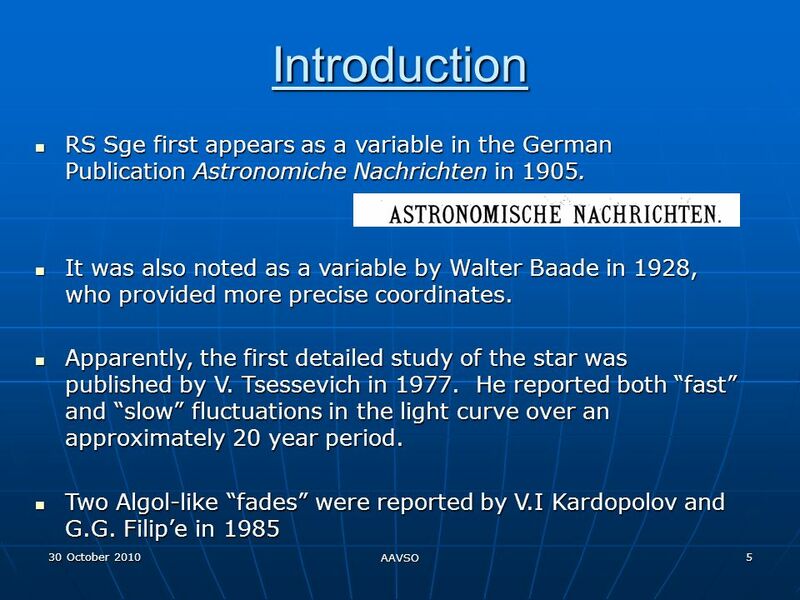 25 30 October 2010 AAVSO 25 Current RS Sge Observations In Dec 2009, a project to observe RS Sge was begun with the AAVSOnet telescopes, chiefly, W30 (Wright-30) a 30-cm Meade LX200 also located at the Astrokolkhoz telescope facility near Cloudcroft, New Mexico SRO, a C14 telescope located at the Sonita Research Observatory in Arizona. 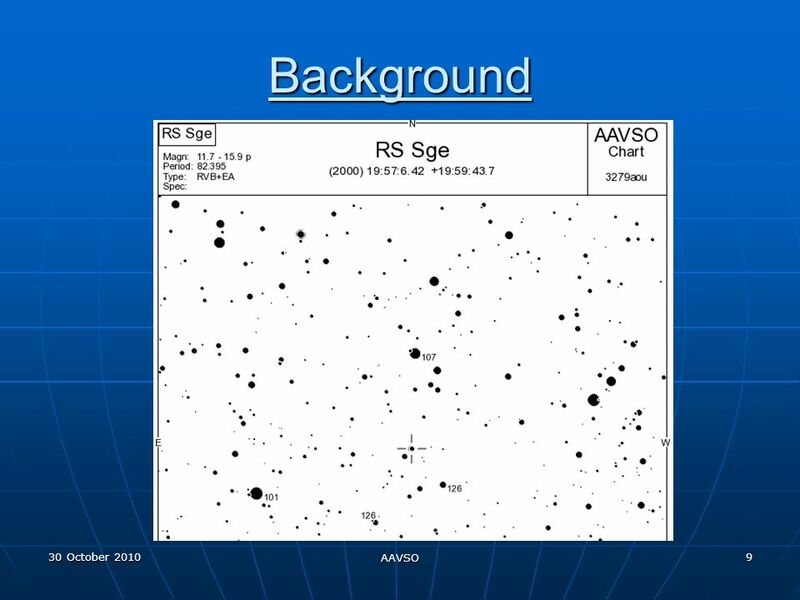 Images were captured in BVRI bands. 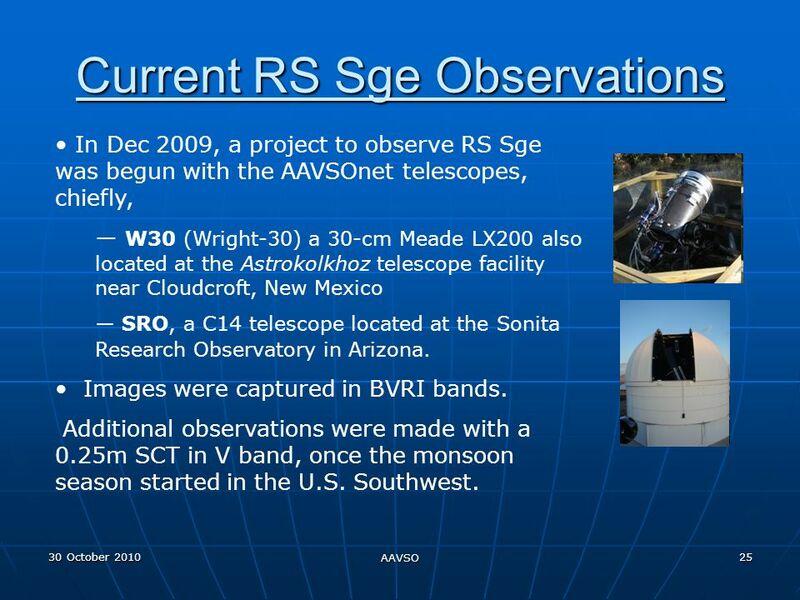 Additional observations were made with a 0.25m SCT in V band, once the monsoon season started in the U.S. Southwest. 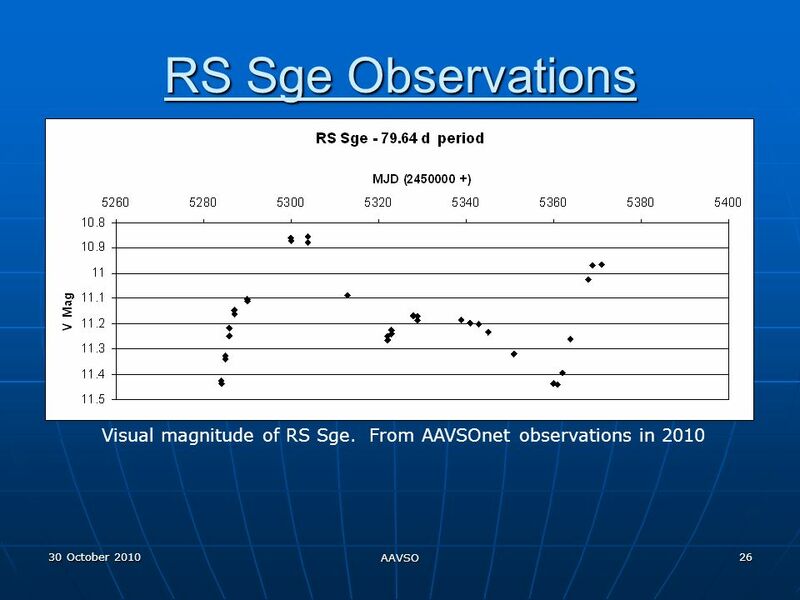 27 30 October 2010 AAVSO 27 RS Sge Observations Comparison of light curve for RS Sge. 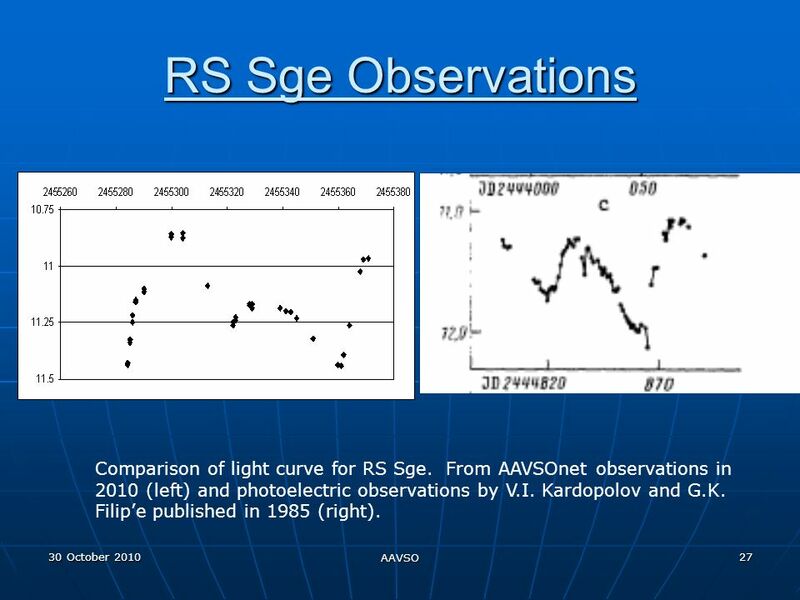 From AAVSOnet observations in 2010 (left) and photoelectric observations by V.I. 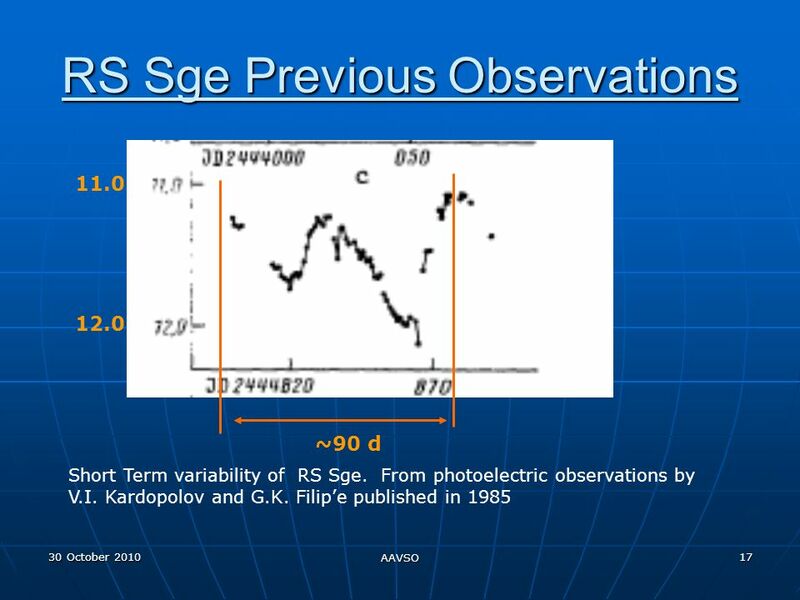 Kardopolov and G.K. Filipe published in 1985 (right). 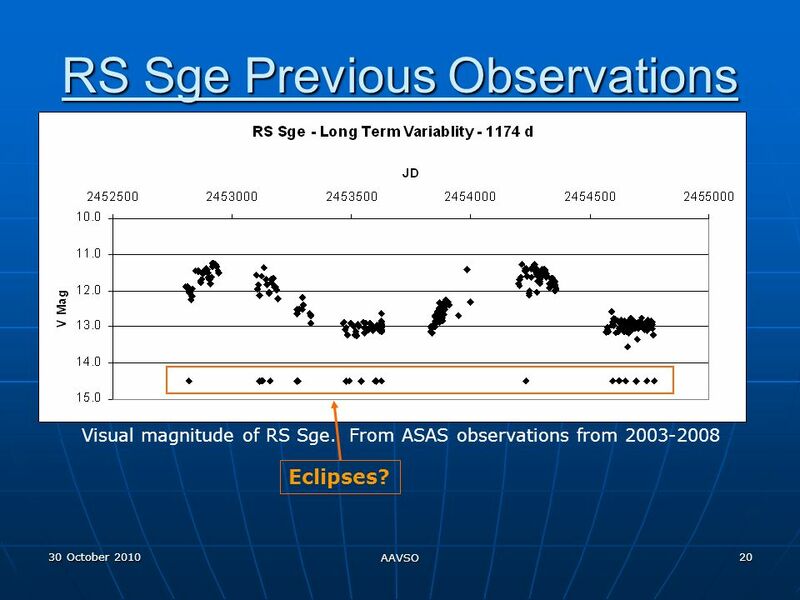 32 30 October 2010 AAVSO 32 RS Sge Eclipses One of the primary reasons for this study is to understand the EA portion of the classification – the eclipses. 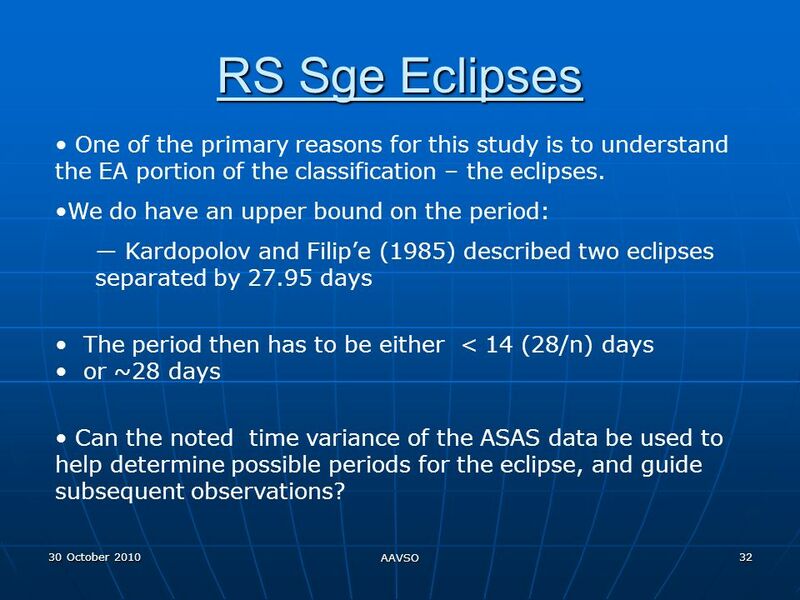 We do have an upper bound on the period: Kardopolov and Filipe (1985) described two eclipses separated by 27.95 days The period then has to be either < 14 (28/n) days or ~28 days Can the noted time variance of the ASAS data be used to help determine possible periods for the eclipse, and guide subsequent observations? 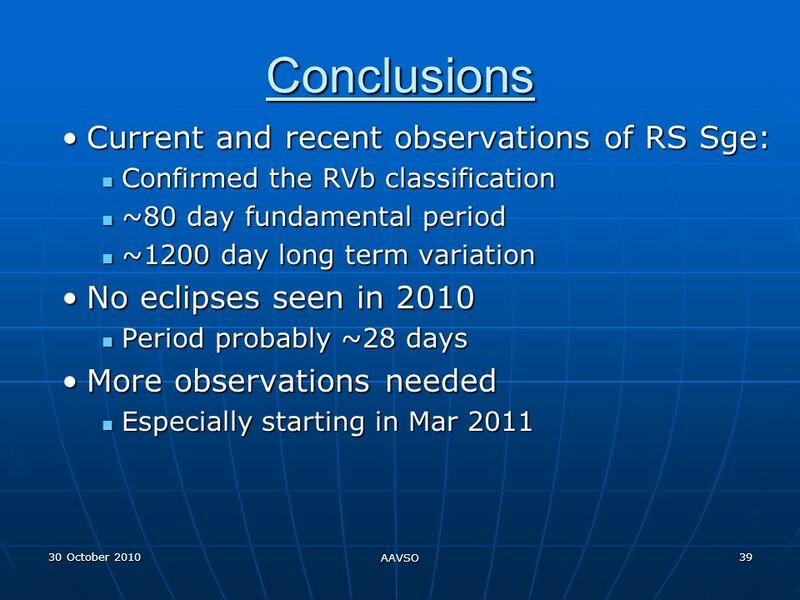 34 30 October 2010 AAVSO 34 RS Sge Eclipses What needs to be done is: Iterate over a large number of periods Measure the difference between the calculated time of eclipse vs the actual data. 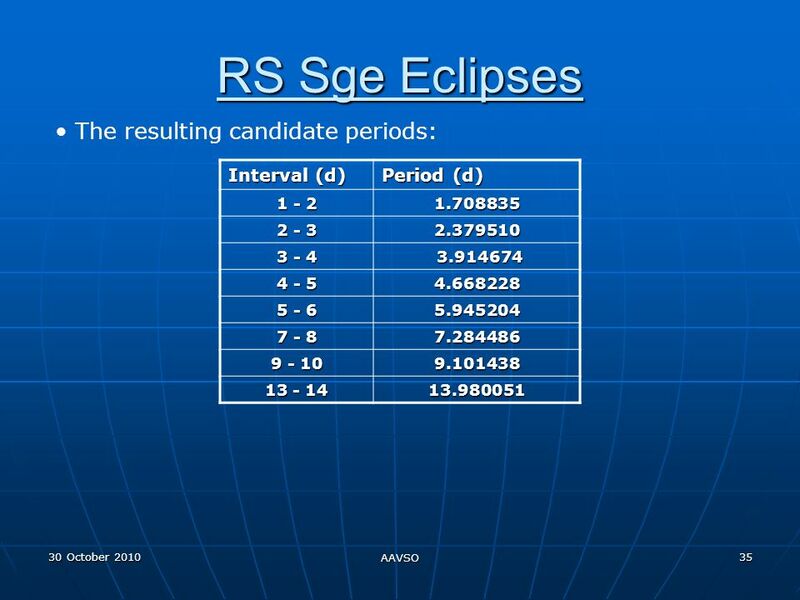 Sum the differences for all eclipse data points Find the minimum variance for the various possible period intervals (1-2 days, 2-3, days…). 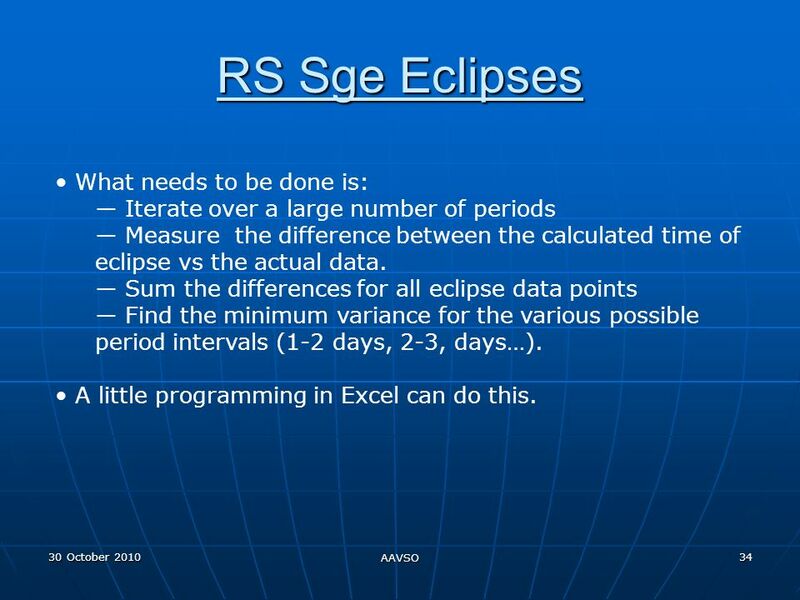 A little programming in Excel can do this. 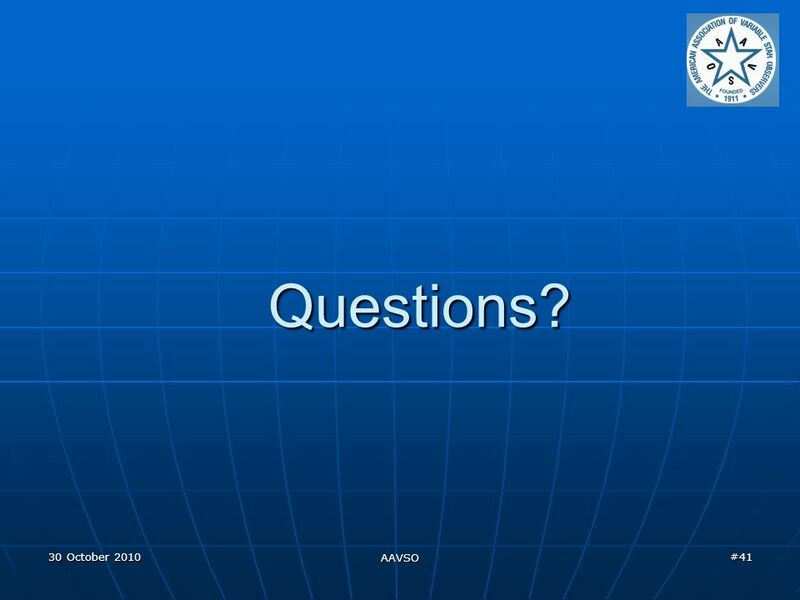 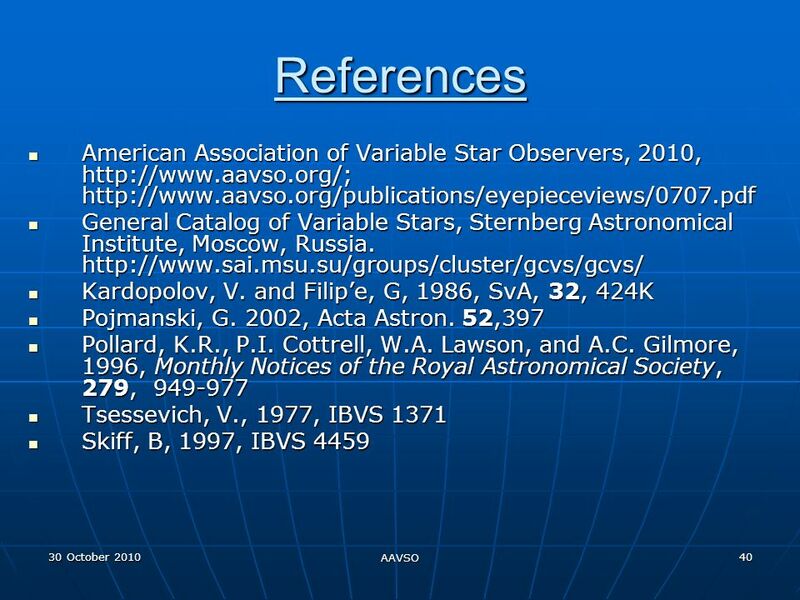 41 30 October 2010 AAVSO #41 Questions? 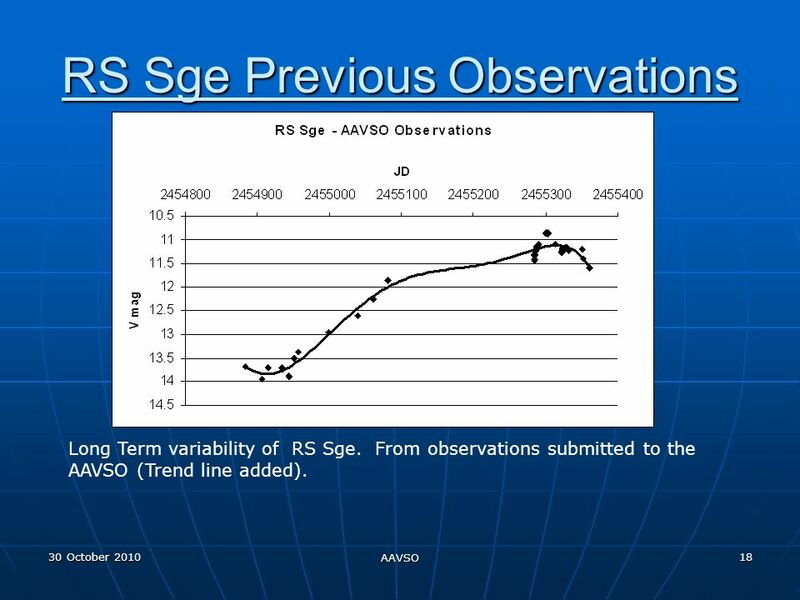 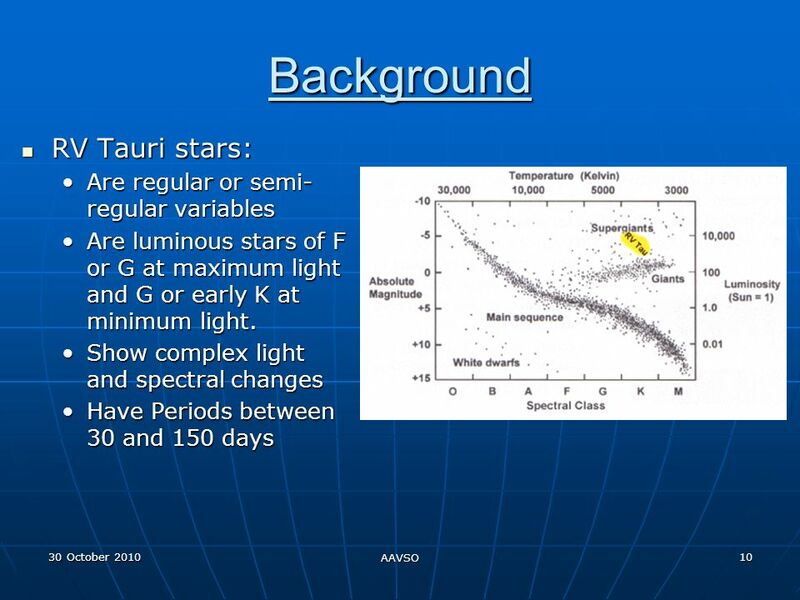 Download ppt "30 October 2010 AAVSO #1 RS Sge Observations & Preliminary Analyses Jerry Horne AAVSO Fall Meeting 30 October 2010."